In this Lightroom tutorial for beginners, you’ll learn the basics of Lightroom. In 10 easy steps. Including; understanding the Lightroom Catalog, best options for importing, how to read a histogram, how to properly export and much more. These are the exact 10 steps I wish were around when I started using Lightroom 7 years ago. Plus, throughout this free Crash Course on Lightroom, you’ll find some Pro Tips too. And today you’re going to learn the 5 secrets to a stress-free editing process and the biggest mistake most photographers do when it comes to their photos. Understanding what Lightroom is and isn’t is a huge step in being able to use Lightroom for what it was intended for. Plus, “step 1” is the foundation for understanding what a Lightroom Catalog is (which a lot of photographers find confusing in the beginning). Not knowing how Lightroom is structured can lead to confusion, error, frustration and all that negative energy we do not want in our lives. Although Lightroom is best known as editing software, it’s much more than just an editing tool. Lightroom is an image management and editing program that was designed specifically for use by photographers. Lightroom was designed to be more of a database vs. a file browser. A file browser would be something like Adobe Bridge or the file/folder system on your operating system. With Lightroom, it keeps a record (in the database – or what’s known as your Lightroom Catalog) of your image and anything that was done to it; editing, keywording, labeling, etc.. Even when your original file is offline, Lightroom can still show you the image and allow you to work on it (if you’re using Smart Previews). 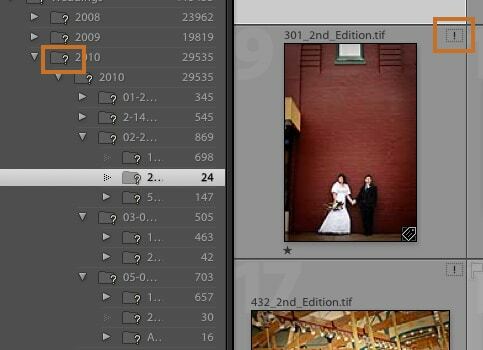 A Lightroom Catalog (the database) is the heart of your post processing. Without one, you can not use Lightroom. If this is still confusing, please post a comment below and I’ll answer your question. Promise! You have 5 important questions you need to ask yourself BEFORE you even open Lightroom. Sure, you can skip this part. But, if you want a stress-free Lightroom experience then I recommend taking the time to complete “Step 2”, before opening Lightroom. Also, you might have answered these already. There here because I speak with a lot of photographers that skipped this step and end up with lots of errors in Lightroom. Let’s avoid those errors! Q1. Where are you going to store your Lightroom Catalog? Before we get to the answer; where you store your Lightroom Catalog can have a profound effect on your workflow. Is it easily accessible? Do you need to take it with you on the road? Your decision can affect your workflow. When first using Lightroom, you may not know what your “workflow” will look like and may not know the best location for storing. No worries. You can move the Lightroom Catalog to another location as you become more experienced with Lightroom. However, after moving the Catalog, Lightroom will be out of sync with the new location and it will think all your photos are missing. This can be easily fixed by re-syncing Lightroom with the new location of the Catalog. A1. By default when you create a Catalog it will be stored in “My Pictures” if you’re on a PC, or in the “Pictures” folder if you are on a Mac. You’ll recognize the Lightroom Catalog by its extension .lrcat. The default location may or may not work for your workflow. 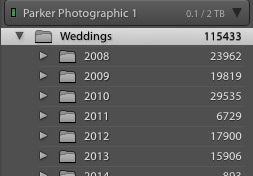 Personally, I save my Lightroom Catalog in the same folder used for my images. If you’re unsure, leave it in the default location now. 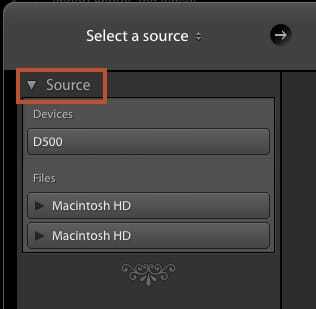 Then, as you become more experienced with Lightroom and develop a workflow, you can move the Catalog if needed. Q2. Where will you store your photos? A2. Again, this can have a direct effect on the speed of your workflow. Laptop or Desktop? Internal or External hard drive? Your choice will affect your productivity. Your choice may be dependent on your budget and what you currently have. If you want your workflow to be as fast as possible you’ll have to make choices that will achieve that goal. Which would be; as much RAM as your computer can hold, an internal SSD drive, the best Graphics processor available for your computer and preferably a desktop. No, you don’t need any of those options. However, if you’re using Lightroom on a laptop with minimal RAM and a slow outdated hard drive, then you’ll be waiting on Lightroom to “process” your images. How much is your time worth? If you’re shooting professionally, would you want to update your computer if it meant getting your editing done twice as fast? 30 minutes to edit vs. 1 hour? That extra 30 minutes of 10 sessions a week adds up. 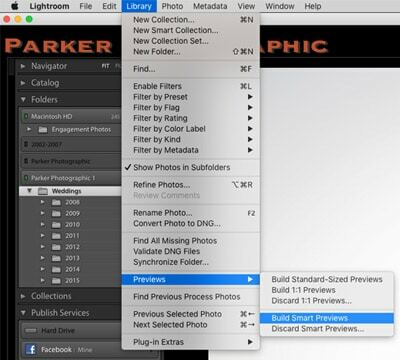 Create Smart Previews if you would like to work with your photos offline. For example; your photos are stored on your desktop, you’re leaving town and can only take your laptop. By creating Smart Previews and exporting the Catalog to your laptop, will allow you to work with your files – even though they are still at your office. Q3. How will you organize your photos into folders? A. Lightroom doesn’t force you to change your current folder system, so feel free to keep your existing folder structure in place if you already have one. It doesn’t really matter to Lightroom what file structure you have. Just keep in mind if you decide to change your file structure (and change any folder names or move them when already in Lightroom) at a later time, Lightroom is not going to know that you’ve changed it and you’re going to have error messages saying that it can’t find your photos. Q4. How will you name your photos? A. If you decide to change your naming structure at a later time (and rename all your photos outside of Lightroom) then Lightroom will give you an error – stating “files missing”. Also if you make your naming structure too complicated, it’s going to make it a lot harder on yourself, and your clients. For example; let’s say a client orders a photo. What would be easier to find and process? For me, I prefer 101. All the other stuff can be added to the metadata of your files via “Keywording”. And the date is already in the Metadata. So, why add it to the file name? Okay, so here we go. The moment you’ve been waiting for. Q5. What is your backup plan? A. Now I know you may have a backup plan already. But, I know a lot of photographers do not. I know this because I talk with photographers all the time that end up losing their photos because their hard drive crashed, or their Lightroom catalog became corrupted and they lost all their edits. Imagine having 10, 20, 30,000 photos in Lightroom with edits on every single photo, and your Lightroom catalog becomes corrupted. You can’t restore the catalog because it’s corrupted, and you don’t have a backup of it. Now you have to redo all your edits for all 115,000 photos. That can be very, very time consuming. If you’re in business for yourself it could be devastating because you don’t have time to go back and redo all those edits. Especially if it’s your busy time of year; middle of the wedding season, 2 weeks before Christmas, etc..
What if a client that you shot 6 months ago calls you and says, “I want to see the photos again to place a new order”. Now you have to go through and re-edit all the photos. Even if it’s just 10 or 15 photos, that’s more time out of your day for something that could have been avoided. There are 2 kinds of hard drives; 1 that has failed and 1 that has not failed, yet”. 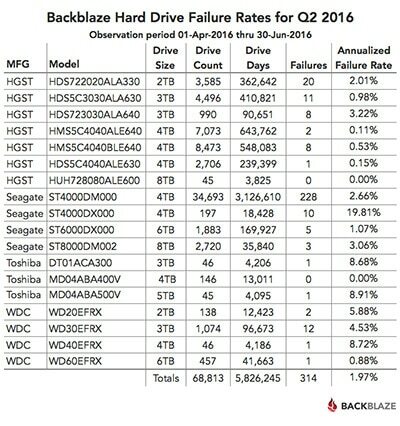 Annualized hard drive failure rate for one of the biggest “Cloud” services, Backblaze – up to 19%! Can you imagine losing all your photos or clients photos? It will happen and when it does, your client will call you the next day (it always seems to happen at the worst time)… “We would like our photos”… but you can’t deliver them because your hard drive crashed and you didn’t have a backup plan. 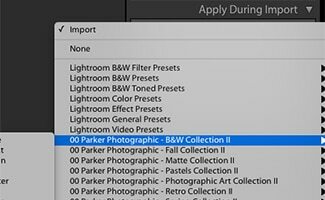 Let’s create your first Lightroom Catalog. If you haven’t done so already, you can download a 7 day free trial of Lightroom from here. But first, what is a Lightroom Catalog? Glad you asked. As we learned in Step 1, a Lightroom Catalog is a database that holds the information about your photo and what you’ve done to it in Lightroom. Any time you edit, label, add keywords, rate them, etc… that info is stored in the catalog. Your photo files themselves are NOT touched. It’s a non-destructive form of editing. 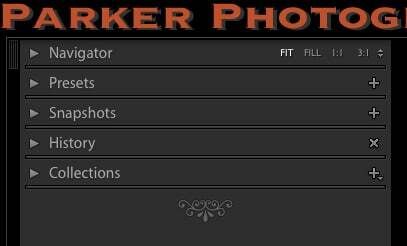 O.k., the good news is, Lightroom will auto create your first catalog when you run it for the first time. When you create a catalog, you create a folder for it too. The name of the folder is the same as the name of your Catalog (without the prefix). Give your Catalog a name and click the Create button. You’re in Lightroom! Now what? So, many tools, features, modules, and more to get familiar with. The best thing to do is become familiar with where everything is located and get to know the Lightroom interface. First, let’s go over the basics of the Lightroom interface. 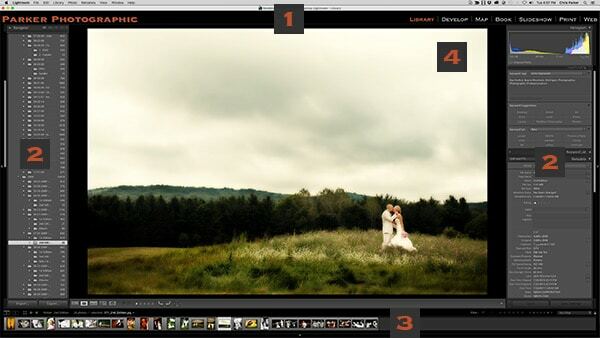 Lightroom is made up of different panels and the main window – where you view your images (in the center). On each side, of Lightroom, you’ll find individual panels that you can show or hide additional information. At the top, you will find your Identity Plate and each of the 7 Modules; Library, Develop, Map, Book, Slideshow, Print, Web. The Identity plate is where you’ll put your logo or just your name. Lightroom also has 2 side panels. These two panels have additional inner panels with all your tools. The bottom panel shows the thumbnails of your photos. The large area in the middle is where you’ll view your images as you work on them. The type of view will be dependent on the Module you’re in. You can hide individual Modules that you have no intention in using. Right click, over any of the Module names and select the one you wish to hide. Voila! That Module is now hidden. Now, let’s do a quick overview of the 7 Modules in Lightroom. This is where you’ll import and organize your photos. You’ll cull, rate, keyword, label and more directly in this Module. You can even do quick edits directly from the Library Module. This is where the magic happens! Plus, you’ll spend most of your time here – editing your photos. A cool feature that allows you to organize your photos by Geographic location – on a map. Allows you to create photo books, directly in Lightroom! Create them and send them off to Blurb for publication. Or export your design layouts to JPG’s and send off to your favorite album vendor. 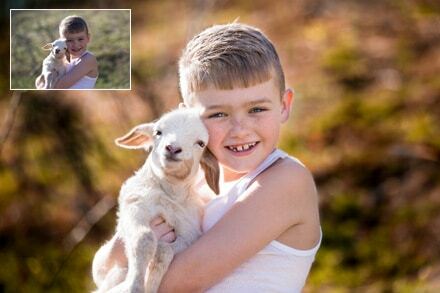 Create photo Slideshows and share them on Facebook or on your website. This is one of my favorite Modules for quickly creating photo collages for my website, Facebook or for print up-sells to clients. All within Lightroom! Create photo galleries and export HTML files that you can upload to your server. Personally, I think this Module is outdated and you’ll find better web galleries from places like Theme Forest. This step is very easy. It can be explained in a matter of 30 seconds. However, there are a lot of options within the import dialogue section that can help streamline your workflow. So, this section isn’t going to skip any details. You’re going to learn about every option for importing your images. But first, since we know that Lightroom is a database and not a file manager, importing is a necessary step in working with your photos. Plus, since it’s a database, it’s important to know that Lightroom is not importing your actual photo! Instead, it creates a “preview” (or thumbnail) of your photo to work on. Which is another reason why Question 5 is important to your workflow. If you still haven’t created a Data Management Workflow, then you’re setting yourself up for some major stress, in the near future. O.k, click on the “Import” button in the bottom left of the Library Module to start importing your photos. 2. directly from your camera. Either option is fine and designed to give you a choice for your own workflow. Let’s start with importing from your hard drive. All of your options are located on 4 different panels; left, top, right, and bottom. First step is to select the photos, from the source, for importing. In the left panel, navigate to the folder of images you’d like to import and select it. Once selected, the middle section of the import window should now start to show a thumbnail of all the files in that folder. If your files are inside subfolders, then make sure to check the “Include Subfolders” box. By default, “New Photos” should be selected and all photos will auto be selected too. Hold down your “shift” key and select all the folders, with images, you want to import. When Lightroom imports your photos, the folder structure will be imported too. First, if you want, you can adjust the thumbnail sizes of the images. In the lower right (under the thumbnails), is a slider for resizing your Thumbnails. Sliding left makes them smaller and to the right makes them larger. Now, unselect all photos by unchecking the “New Photos” box (top left – just above the thumbnails). Then, to select a row of images – first select the first photo, then hold down your shift key and select the last image in the row. Those 2 photos and all in between will now be selected. Finally, click a dark gray box (top left of your thumbnails) and all of the images will be selected for import. To select a random assortment of photos; hold down your Alt key (PC) or your Option key (Mac) and randomly select the photos you wish to import. Finally, click a dark gray box (top left of your thumbnails) and all of the images will be selected for import. Copy as DNG – This option will copy your files to a new location, import and convert to DNG. DNG stands for; Digital Negative. Whole books have been written about DNG. Click here if you would like to find out more about the DNG file format. Add – selected by default. Will add your photos to the catalog without moving them. Tip: I’ve always used “Add”. I’ve never had a need to copy or move them while importing. It’s just not part of my workflow. Now let’s take a look at the right panel. Lots of stuff to choose from here. The most important choice is the first one; “Build Previews”. This will have a huge effect on your productivity. So, let’s go over each of the different options and then you’ll be able to decide which one will be best for you. Minimal – Smallest size preview and will import/process the fastest. Standard – A decent size preview larger than the first two. 1:1 – Highest quality preview and will take the longest to import/process. If you choose anything other than 1:1, then when you go to edit an image and zoom in, Lightroom will have to create a 1:1 preview before it’s able to display the image for you. So, my recommendation is to select 1:1 from the beginning. Yes, it will take longer to process your images. However, you can work on another project while they import (especially if you’re importing thousands at once), import overnight or allow a hundred or so to finish importing and then you can still work on those – while the rest continue to import. Your choice; wait for the 1:1 previews to be built while you work on something else or stare at the computer each time a new photo has to be re-built to 1:1. Smart Previews allow you to edit your photos when the external link to your original photos is broken. For example; if you have an external hard drive setup on your computer, but then it’s disconnected from your computer you can still edit your photos if you have smart previews built. If you don’t have smart previews built, then when that external drive is disconnected from your computer, you will no longer be able to edit your photos (in Lightroom) until the external drives are reconnected. Smart Previews are awesome for photographers that travel a lot or maybe use more than one computer. 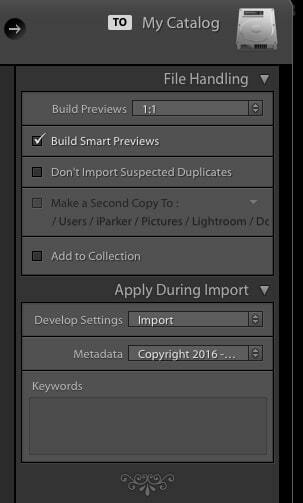 If you would like to work on your Lightroom Catalog on the road or plan on storing your working files on an external drive, then select Smart Previews. “Don’t Import Suspected Duplicates” – pretty self-explanatory. If you need further info, please comment below and I’ll provide some clarification. When You select the option “Add”, then “Make a Second Copy To” will be grayed out. Since you’re not moving or copying the files that option is not needed. “Add to Collection” – I love using Collections. Let me explain what they are. Basically, a collection allows you to store your favorite photos for easy access at a later time. Just like previews, they’re are Smart Collections too. Smart Collections are just that. Smart. Let me explain. When creating a Smart Collection, you can apply rules to that specific location. For example; Let’s say you want your Smart Collection to consist of all “5-star” photos with the keyword – “wedding”. 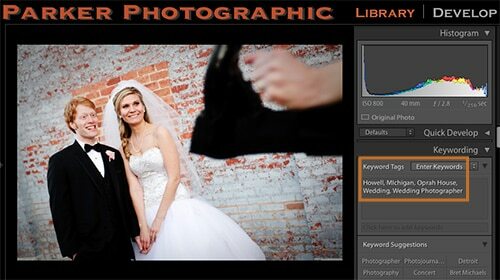 Now, you import your wedding photos and begin to rate and keyword them. So, all the photos get the keyword “wedding”. Then, you start to rate the best photos with 5 stars. Every photo that you rate with 5 stars and has the keyword “wedding”, is now AUTOMATICALLY added to that Smart Collection! How cool is that? I love it! The first one is my favorite; “Develop Settings”. This option allows you to apply specific edits during import! For example; Let’s say you want to add a Vignette to every photo. First, create the Develop Preset, save it and then you can select from the drop-down menu. When you import your images, that specific Develop preset will be auto applied to every photo. I love it when my software does things for me automatically! It’s a huge time saver. The next one is; “Metadata”. Which does the same thing as Develop Settings. However, this one will add “Metadata” to your file – like a Copyright preset! I recommend creating a Develop Preset that will contain your Lens Correction settings and your Camera Calibration settings (plus any other adjustments you want to add). Then, apply those during import. It’s one less thing you’ll have to do during the editing process and it’s a huge time saver. Ok, so one more thing and that is keywords. If you have global keywords (wedding, portrait, etc..) you can add your keywords here. Then all the keywords will be applied to every photo during import. Have you heard of Develop Presets? I’m sure you have. They are the most popular type of presets in Lightroom. However, they are not the only kind of preset. See all those settings you just selected? If you come back tomorrow you may decide to select something else. But, if you create multiple presets, then you can select it and all the settings will be updated based on that preset. Perfect if you have different types of shoots that require different Develop Presets added during import. To create an Import Preset; go to the bottom panel and click on “None”, select “Save Current Settings as a Preset”, give it a name and click create. Now, when you come back, just click on that same drop-down menu and select the preset you want. And now for the moment, you’ve been waiting for. Let’s import your photos by clicking on the button “Import”. In the top left of your interface, you’ll see the progress of the import. Congratulations! Your photos are now in Lightroom. Now let’s look at the options for importing from your camera or external device. 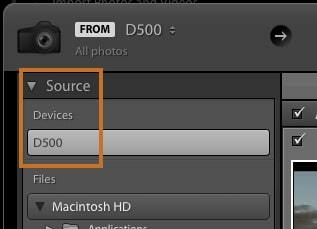 Once your camera is connected to your computer, you’ll see it under “Source”. Go ahead and select it. This time Move and Add are grayed out. Your only options are Copy as DNG and Copy. Copy is selected by default and this will copy the files on your camera to a location of your choice. To select the destination, you’ll find a “Destination” inner panel, to the right. Choose your hard drive, select if you want them in a Subfolder and if so, you’ll need to select Organize and Date Format. Another new option, for importing from a camera, is the “File Renaming” inner panel. If you wish to rename during import, select that option and choose the naming structure of your choice. Now that you have your images in Lightroom, it’s time to get creative and start editing your photos. The next step to your workflow should be to get organized. UGHHH! I know. It’s not fun at all. In fact, being organized is not one of my strong qualities. Getting organized is a chore I’d rather not do. But, Lightroom makes it sooo easy to stay organized it’s almost fun. Almost. Press the letter “x” on your keyboard to add a “rejected” flag to any photos that should be, well, rejected. Once you have all the keepers, you can begin to start rating those photos. Use your star system to give 5 stars to the very best images, 4 stars for very good photos, 3 stars for “o.k.” photos, etc… or whatever system you devise for your organizational workflow. Then, you’ll want to add any keywords for easily finding 1 photo among 115,000, in a matter of seconds. Open the Keywording panel and start typing in words that describe the photo – in the box under “Keyword Tags”. 5-10 good keywords should be good. Use keywords that describe, in detail, what that photo is all about and maybe a specific location. Not sure about adding keywords? If you’re a pro photographer, then this Pro Tip will change your mind. We all know that everyone is now a photographer in our digital world. It’s getting more and more crowded with “pro” photographers. To increase your chances of being found, you need prospects to discover you and drive them to your website. By adding keywords to your photos you give search engines, like Google, Yahoo, Bing the info about your photos and they’ll be added to their content. When a prospect searches for a wedding photographer, they may type in something like this; “Tawas city Michigan wedding photographer”. When they do and you have those keywords applied to your photo, it will be listed under “images”. P.S. It’s important to add your copyright info too – with your web address. Getting organized isn’t a lot of fun. But, you’ll thank yourself later on. And maybe me too! Plus, if you read the Pro Tip, you know an extra benefit of adding keywords. You’ve organized your images and now the fun begins! Let’s head on over to the Develop Module; keyboard shortcut = “D”. So many inner panels and tools to help you achieve your creative vision! Well, first, let’s take a brief look at and become familiar with each inner panel. You’ll learn the basics of each editing panel and then we can go from there. The left panel holds your pre-made presets, snapshots, history and your collections. Pre-made Presets; presets are nothing more than editing data that you saved from a previous edit (or maybe you purchased pre-made presets from other photographers). You edit a photo and it’s amazing! So amazing that you’d like to save the edits, you applied for that particular photo, and apply it to another photo or for future photos. As long as that new photo is similar to the original photo (in color, lighting, and much more) you will have somewhat satisfactory results. It’s rare that a pre-made preset will work 100% of the time, with one click. Most of the time you’ll need to do some tweaking for best results. Snapshots; Allows you to save your editing at different stages of your workflow. Then, easily go back to a specific point if you need to go back in time – maybe the editing to a turn for the worse. History; Records every step you took while editing your photo – in the order you made them. This list can get quite long. That’s why there are Snapshots. Create a Snapshot and clear the History. Collections; Another method for organizing your images as you work (as we discussed in a previous section. Allows you to group specific photos in one place for easily viewing and/or performing other tasks. For example; you could have a Collection of all your 5-star images from Florida. This gives quick access, to the best photos, to market your work in Florida. The “Right Panel”, is magically delicious! This is where the tools are located to help you achieve your creative vision. 95% of your editing can be done directly in Lightroom. I know this as a user of Photoshop since 1991 and a Lightroom user since 2007. 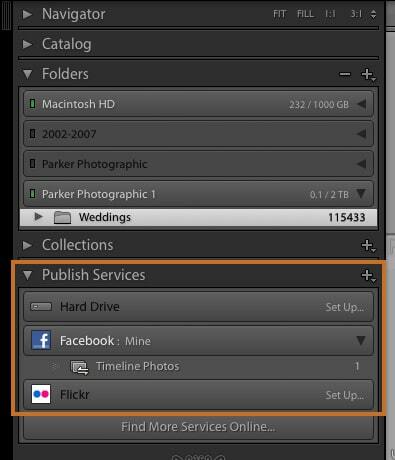 I’ve processed over a million photos directly in Lightroom for my wedding clients and the post-processing service I provided to photographers around the world (Photographic Elements – now closed). Let’s start with the Histogram. The Histogram is a visual reputation of your photo in graph format. Everything you need to know, about editing your photo for proper exposure and dynamic range, can be seen here. 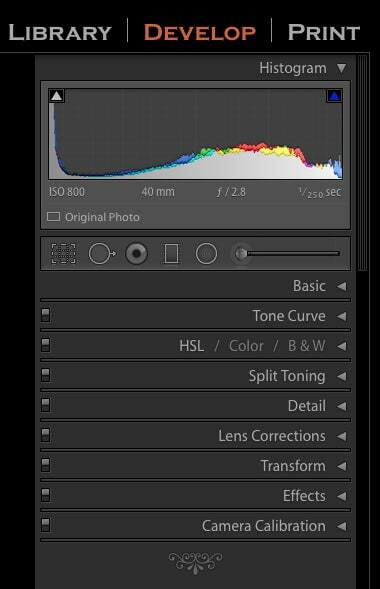 Knowing how to read your Histogram will help streamline your workflow and help you be more productive. If you have a large gap of information on the left or right side of your Histogram, then you’re image is over/under exposed. Large peaks on the Histogram mean parts of your photo has no details. A perfect Histogram (most of the time) has data from the far left (your highlights) to the far right (your shadows) and no major spikes (loss of detail). The exception would be low-key or high-key photos. A good Histogram means you captured the full Dynamic Range for that photo. Which means a better quality image and less editing to “fix” the mistakes not done in camera (not nailing exposure, white balance, composition, etc. during capture). A quick tip on how I view the panels for my workflow. My workflow consists of 3 stages; Clean, Custom & Creative Edits. 1. 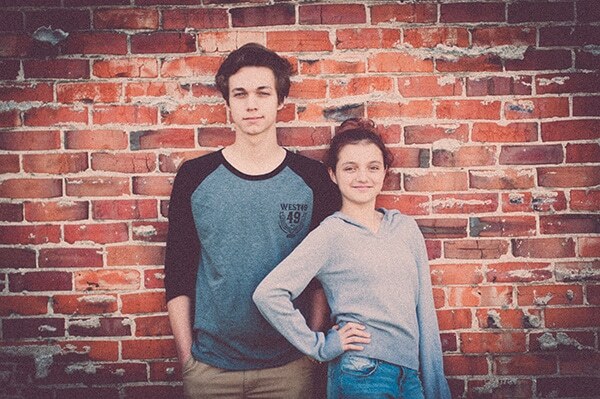 Every photo session, event, or personal photo gets a “Clean” edit = Basic & Tone Curve panels. 3. Less than 1% get a Creative Edit = HSL, split toning, detail, effects, and more. This allows me to be consistent from one session or event to another, prevents me from doing too much “editing” for clients (I show them only the best and provide “creative” work for up-selling or for premium packages), and allows me to spend less time in front of the computer – so I have more time to shoot, or spend with family, or for “me” time, or just to keep my sanity! Click here, to download a PDF outline of my Editing Workflow. Basic adjustments are applied here. You’ll set your White Balance, adjust the Exposure, Contrast (I prefer using the Tone Curve for adjusting contrast), Dynamic Range (Highlights, Shadows, White & Black points), add Clarity (adds contrast to the mid-tones), adjust the Vibrance (adjusts the colors only for the mid-tones), and Saturation. Precise control over adding or removing contrast. You’ll manipulate a Linear line to add (or reduce/remove) contrast in the Highlights, Shadows or anywhere in between. Plus, you can control the individual RGB channels to alter the contrast for the Red, Green and Blue channels. 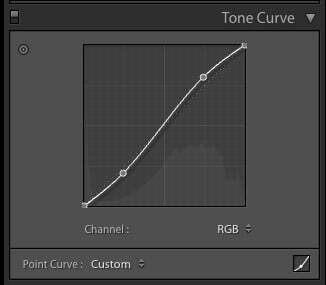 The Tone Curve gives you much more control and creative options vs. just the Contrast slider in the Basic panel. The HSL panel allows you to edit specific color channels of your particular image. Plus, you can convert to B&W and also alter the individual color channels for a more custom, unique B&W vs. just removing all the color from the Saturation slider. Let’s say you have a Fall image and would like just the “Orange” colors to be more vibrant. Go to HSL, then Saturation and move the “Orange” slider to the right. The orange colors in your photo will now be much more “saturated” (more intense). Pretty cool! Split Toning will allow you to add colors to your Highlights and/or Shadows. You have total control of how much color is added with the Saturation slider and the Balance slider. The panel to go to for making your images sharper. Plus, you have some sliders for reducing the dreaded digital noise. Sharpening should be the last thing you do to your image. Why? You run the risk of over sharpening if you do it at any other time. Especially if you use Clarity to add contrast (looks like sharpening) to your mid-tones. Some would argue that you can just go back and reduce the sharpening in that case. True. But, why waste time doing it more than once? TIP: Hidden keyboard shortcut for determining if you Over Sharpened = hold down the, Alt key (if you’re on a P.C.) or Option key (if you’re on a Mac) as you make adjustments with the Amount, Radius, Detail and Masking sliders. Your image will turn to B&W and it’s easier to see if you’re adding any artificial artifacts (means you’re over sharpening) to your image. If you shoot RAW, then you’ll want to do this for EVERY photo! The Lens Correction panel will fix any distortion created by your lens. And yes, every photo creates a certain amount of distortion. Rember when we talked about applying Develop Presets during import? This is a perfect example of creating a preset to allow Lightroom to do something automatically, for you. 4. Now apply it during import! I love it when I can setup Lightroom to do things for me automatically. Import presets will help you streamline your workflow and be more productive. Within this panel, you can fix the perspective of your photos. Did you take a photo, with a wide angle lens, of a building? And is that building “leaning”? Then, use the Transform panel to fix it. However, if you have people in your photo too, once you fix the building the people will be “distorted”. So, just be careful with subjects in your photo. From here, you can add a Vignette or if you want a more vintage look, you can add some Grain (or a lot of it). Use this section to tell Lightroom how to interpret colors from your camera. You can choose the Profile that matches your personal style, adjust the sliders and then save it as a preset (to be used during the import process). This way, all your images start off with the proper color profile and means less work for you during the editing process. Depending on your photographic style; indoor, outdoor, night, etc… you should create a profile for the different types of locations you shoot in. We’re almost done and then we can go to Step 8. You have a whole set of other tools to learn about first, though. A tool to “crop” and straighten your images. Although this tool allows you to easily remove “spots” (dust spots from your camera), you can do so much more with it. In fact, I use it to retouch my photos directly in Lightroom. It’s great for removing unwanted objects, like pimples, cigarette buds, people and more. It’s not as powerful as Photoshop. However, I can do 95% of my retouching in Lightroom. Remove the scary and dreaded “Red-Eye” from your photos. It also has an option for removing “Pet-Eye” (your pet’s eyes will turn green vs. red – from your flash source). These 2 are my second favorite tools in Lightroom. With them, you can precisely add edits, exactly where you want them, with a linear graduated adjustment or a radial adjustment. 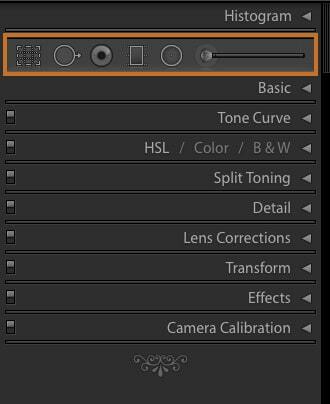 This is bar far my number 1 favorite tool in all of Lightroom. It gives you the same precision and control once only available in Photoshop. Like the last 2 tools, you can precisely apply edits – exactly where you want them – but with a brush. Simply “brush” on your edits anywhere you want on your photos. Then, at a later time, you can go back to that edit to further tweak the adjustments, erase part of it, move it and more. Simply amazing what you can do with the Local Adjustment Brushes. O.k., we’ve covered the main tools in the Develop Module. There are other tools within as well. Such as; Soft Proofing, the ability to rate, label and more all within the Develop Module. With all the different tools, it’s important to have a workflow that you can follow for every image. When you do, your edits will be consistent and you’ll have a fast, productive workflow. Now that you know all the tools, where do you start? From the top. With your Histogram. Is your image too over or under exposed? Then, you’re Histogram will tell you and by how much. Do you have a gap, in your Histogram, on the left or right side? If so, you can quickly apply the adjustment on the Histogram itself. To do so, place your mouse cursor over the edge where the gap starts and drag to the left or right. A perfect exposure will have no gap. After reading your Histogram, it’s time to adjust your White Balance, the Dynamic Range (Highlights, Shadows, Whites & Black points), and the Presence. Next up, adjust your Tone Curve to adjust the contrast. To do so, create what is known as an “S” Curve in the Tone Curve panel. Here’s how; Click where the right point of the first “box” in the lower, left corner is and drag down. Then, click on the corner of the “box” in the upper, right corner is and drag up. You should now have an “S” curve like the image to the left. Drag the anchor points higher or lower to add/remove contrast – and make your image pop more (or to make it flatter). For my workflow, my next steps are determined (ahead of time based on my written workflow) by what stage of the editing process I’m in. So, for you, it all depends on what you’re trying to achieve with your edit. A clean “Natural” edit, then you’re done once you’ve completed the Basic & Tone Curve panels. If you want a more creative edit, then you can use the remainder of the inner panels to achieve the look you’re after. Once you’ve completed making all the adjustments, it’s time to start working with the 6 tools in the “Tool” bar. My workflow is flexible and not set in stone. For example, sometimes I’ll use the Crop Overlay tool before I do my “Natural” edits – especially when it looks very crooked. Other times, most often, I’ll straighten after all my edits are done. As for re-cropping for composition, I rarely have to do this since I crop in camera (saves me a ton of time afterward). Next, I apply the Graduated filters (if needed) and then I’ll use my Adjustment brushes to customize the edit. The last thing I’d recommend doing (besides Sharpening) is to do your re-touching with the Spot Removal tool. The more you have to retouch, means more edits being applied to your image. Every time you add an adjustment (this goes for the Filters and brushes too), the more “anchor” points you add (which holds the data for that edit). With more of these anchor points, the longer Lightroom takes to process the edits for you to see them. Which means your computer will get slower. If your computer is getting bogged down and slow as molasses, try updating your computer (more RAM, SSD drive, new graphics processor, etc). Also, you can accelerate your existing Graphics Processor in your Preferences. Go to Preferences > select the Performance tab and check the box next to “Use Graphics Processor”. Depending on your system and setup, this option may have the opposite effect. If you find everything slower, then turn off this option. That’s it, for now, for the Develop Module. Share your photos on your Facebook timeline, directly inside of Lightroom! First, head on over to the Library Module and locate the inner panel; Publish Services (and click on it to open). Next to Facebook (and Flickr) you’ll see; “Set Up…”, click on it to start the process. You’ll now be in the Lightroom Publishing Manager. From here, click on each of the Settings and fill in the necessary info. When done, make sure to click on the Save button. Once saved, your Facebook account should now be linked with Lightroom. To share a photo on your Timeline, drag a photo from the view you’re in and place it over the text; “Timeline Photos”. You should now have a number “1” (tells you how many photos are available to share in Facebook) next to “Timeline Photos”. Now, click on the Timeline Photos to see a list of photos ready to be “Published”. Select the photo (by clicking on it) and then click the “Publish” button. Go ahead and check your Facebook timeline to see your photo. How cool is that? Let’s get your images out of Lightroom to share with your clients, for yourself, and more. How you get them out depends on your output of choice. Do you want print enlargements, JPG files to create an online photo gallery for your website or to create a photo album in your favorite album design software? If so, then you can export from the menu. 2. Go to File > choose Export. Your files will now be exported to the location you chose. Yes, you can create “albums” in Lightroom with the Book Module. However, for me personally, I prefer to use Photojunction. It’s quicker and easier, in my opinion. I’ve used it to design thousands of albums for my clients and for my photography clients too. If you want to create a book, use the Book Module. If you want to create a Slideshow, to share with clients or for personal use, use the Slideshow Module. If you want to output multiple photos on a page (for in-home printing or to send off to the lab) use the Print Module. I love using the Print Module for creating photo collages too. Never stop learning. Whether it’s Lightroom, Photoshop or Photography. Since this is a crash course on Lightroom, let’s dig a little deeper on what else you can learn. For starters, this course has only scratched the surface. There are a lot of keyboard shortcuts (some are hidden too and not known as well as others) that can help you streamline your workflow. Which brings us back to a word I’ve used throughout this course; “Workflow”. Within Lightroom, you have a lot of tools and options for “processing” your photos. Whether it’s importing, exporting, organizing, rating, labeling, editing, etc..
For example, you can have a workflow for; importing, organizing, editing, exporting, data management, etc..
It’s best to have a workflow for every stage of the process. All of them make up your complete Workflow. Having a Workflow means you’ll be stress-free and as happy as can be. Not having one, could lead to frustration, anxiety, and sleepless nights. If you do nothing else, you should at least have a Data Management Workflow. If not, you’re playing with fire and risk losing everything. Every photo, every edit, and possibly a financial disaster – if you’re a pro photographer. You also have a lot to learn about “how to edit” your photos to fulfill your creative vision. We’ve gone over some of the basics. But, knowing more about each slider and how it effects your image (good or bad) is key to a quality image. If you over edit, or place the sliders too far – in 1 direction or the other – it could lower the quality of your image. All of which is beyond the scope of this Lightroom Tutorial for Beginners – Crash Course. After all, this is just a crash course. It depends. Do you want to learn Lightroom over a period of months or years? Then check out the other articles and blog posts on this site. Visit other Lightroom blogs and check out Youtube. There are a lot of free resources that can guide you on this tool or that. But beware, there are a lot of so-called experts that provide misinformation. There are also a lot of great teachers out there as well. It just takes a lot of time to sift through the good from the bad. Or do you want to learn as much as possible in a matter of days or weeks? Do you want a more structured learning experience, to be able to ask other photographers (in our private FB group) questions, personal access to my email and more… then, check out my premium courses on Lightroom; This one, this one, and this one. I’m here to help you achieve your goals with Lightroom. Do you have any questions about the content of this Lightroom tutorial for beginners crash course? If so, ask away in the comments and I’ll do my best to answer your questions as quickly as possible. We only ask for your email to grab your Avatar.